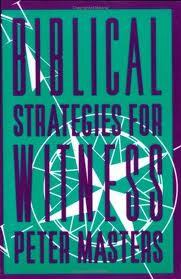 "Biblical Strategies for Witness" by Dr. Peter Masters is a must read if you are interested in learning how to be effective in the vital area of being a personal witness for the Lord Jesus Christ. Essentially, this book takes a closer look at how the Lord Jesus dealt with a variety of needs and types of people that need the Gospel. The ideas presented in the book are simple but profound. I do not want to give to much of a description about the book as to spoil the potential reader. I have greatly benefited from this in ways like being challenged concerning becoming a personal witness, I have been reminded that the Word of God is still the best (really the only) remedy for the needs of people, I like how Dr. Masters takes a simple verse and opens up the spiritual and pastoral potential of that verse and how it directly relates to a clear Gospel presentation. This book is both a challenging and enriching read. (C) 1994, Paperback, 154 pages of provocative reading.